I just cracked the seal on my kid’s trunk. Oy. It contained (among other things): 6 carabiners, a harmonica, two CH hats, over a dozen letters from his Pop in Florida, a certificate honoring his bugling at camp this summer, filthy socks, and about a pound of sand. And the smell. I won’t complain. I’m just glad to have him home. It’s a fierce thing – a summer at camp. These young Highlands men have been challenged in ways they may have never expected. Sure, they knew backpacking over 100 miles on Isle Royale would be difficult. They knew shooting a bullseye in archery would require lots of work. But they might not have known they were going to have someone in their cabin they didn’t really jive with. It’s not easy to co-habitat with a cabin full of kids all summer! Your boys have tried and succeeded at many activities, and failed at others. They’ve had highs and lows. It’s a lot like life in general. I’ve been reflecting on MY summer at camp, and one unexpected discovery I made was the blessing of truly backing off of my kid. I want to be a “free-range” parent, but my inner control-freak sometimes gets the better of me. There’s a lot to be said about the many, many men (young and old) that teach and mentor my kid here at Highlands. I didn’t have to hound the boy about setting goals and sticking to them. His ski instructors did that for me. I got to take the summer off from nagging him about picking up his towel. His counselor did that for me (or didn’t, who knows and ultimately, who cares!?). His dad didn’t have to say, “J, you don’t need to control every situation.” Kent Overbey was able to gently remind him that there might be a better way to make friends than bossing people around. Let me tell you, time stopped when I heard my boy recite the “Worthwhile Man” prayer from memory last week. This Highlands thing. It’s sinking in! And last night at the final banquet, when the entire dining hall joined Andy in the prayer without prompting, I was overcome with emotion. Talk about magic! Moms and dads, you should be very proud of yourselves. It’s also fierce to ship your kid off for a month (or more!). In this day and age of fear and shock, it’s often difficult to drum up trust in others. We know it. We appreciate it. We are honored you believe in the Highlands experience. Thank you parents, grand parents and everyone who supported these guys in their adventures at camp. If we haven’t said it before, we LOVE these kids. We hope that they come home a little tanner, a little more unplugged, a little more polite, a little more capable, a little more dependable. We hope they’ll share their experiences of camp with you, and that they’ll talk a little bit more about what “I’m Third” means. We are so proud of these kids. You should be too. We’ll see you back next summer. Goodbye little cabin! God, make of me a Worthwhile man. When other folks have left the fight. That if he will, he can. the good, the kind, and not the base. Blot out from me all shame and greed. By constant, active self control. And keep me pure from day to day. Oh make of me a worthwhile man. If the weather a couple days ago was awesome, it’s pretty ragged today. Cold and rainy. However, we are looking forward to a slightly warmer day tomorrow with lots of sunshine. That’s great. You might grab a jacket on your way up to camp, though. It’s only going to get up to 71° the weatherman is saying! That’s nearly freezing by my Florida-girl standards! Tonight the guys will participate in an age-old tradition, the Kerchief Ceremony. 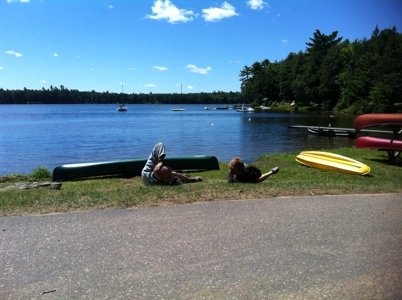 It’s another opportunity for boys to reflect on the less obvious benefits of a summer at Camp. Sure, they’re celebrating their achievements in activities, but even more, they are celebrating their bond to 109 summers of young men just like them. Boys that have run on these fields, slept in these cabins. Like many things at Highlands, it’s special. You can read about the ceremony in an essay written by our program director and alumni Craig Ericksen. He’s got a unique perspective as a former camper, father of campers, and staff member. The dreary weather is not stopping the packing or the lost and found collection! The laundry is clean(ish), so hopefully, your boys trunks won’t be too terribly stinky upon their return. I’ve heard lots of great ideas on how best to unpack your camper when they come home. Two tips that were passed on to me: unpack the trunk in the driveway (sand! ), and just throw the socks away (they’ll never be the same). Moms and dads, do you have any other tips? We’d love to hear about them in the comments below. We should probably warn you about your camper’s reentry to the “real world.” I know in *this* Highlands family, we are all a little crabby after camp ends. We’re tired. We have culture shock. Yes, we’re happy to have 247 TV channels at our fingertips high-speed internet, but we are really ships without a rudder since we don’t have the bugle to tell us where to go! We miss our friends, our routines, the lake, Taps. Lois’ meatloaf. It’s hard. Again, moms and dads? Do you have any words of wisdom, or stories you can share to help the new camp parents know what to expect when their kid comes home after a month of living under a bug net? Remember the final fun starts tomorrow at 3 pm at the Cub/Colt swim pier for the Water Carnival. You’ll have time to get your camper loaded up, a chance to shop at the camp store, and an opportunity to review the lost and found before supper starts at 6 pm. The banquet wraps up around 8:30. It’s a great way to wrap up the summer, and can help you understand what the last four weeks have been about for your boy. We’ll see you there! Elsworth says, "Summer's almost over!" This weather. It brings a tear to my eye. I hate to brag, because I know many of you have been hot and sweaty all summer. But this day. It is perfect. It’s great for the boys who are out finishing up earning their ACs (achievement credits). Activities are open, which means your boys get to pick where they go. History was made this morning. Elsworth the moose, who proudly hangs over the kitchen doors in the dining room, spoke to us after a 25+ year nap. He made an announcement about the 1st annual Elsworth Pine Wood Derby which will take place on Thursday. And then he led us in a cheer. It was awesome. Only at camp, folks! This week is so fun. Tomorrow we’ll have the Top Shot competition at riflery, and a Wacky Canoe race. Thursday is the Art Show and the Derby Race. Add that to a final Division Day (Cubbies go into town to Jim Peck’s zoo, a picnic at Clear Lake and then lumberjack show), Seniors Dream Burger picnic, Stunt Night, Kerchiefs and the Banquet – and you’ve got the recipe for awesomeness. It’s a fun week, but bittersweet. The wind has shifted, there is a crispness in the air. The nights get down into the 50s. It all means this summer of fun and self-discovery, challenge and friendship, is growing to a close. I just don’t know how I feel about that! Not many camps can boast the kind of food we eat here at Highlands. At many camps, food is prepackaged, frozen and fast. At Highlands, meals are homemade. Meatloaf is mixed (70 lbs. at a time), cakes are made from scratch, and hundreds of pancakes are lovingly flipped – for groups of 150-180 people, three times a day! WOW. And the woman that makes it all happen is none other than CH Hall of Famer, Lois Craig. For 24 summers Lois, with her team of kitchen assistants, has been fueling the bodies and minds of our young men. We thought you might like to get to know her a little better. TB: Lois, I’ve never known Highlands without you, and I’ve been here for 15 years. How long have you been coming to camp? LC: This summer will be my 24th summer. My parents were good friends of Snow and Mim (Sharon B.’s parents). After graduating from Illinois State University, I started teaching home economics in the small town of Bath, Ill.. I started cooking for camp that summer of 1974 and continued until 1976 when I met my husband, Dale. We visited a number of times when my kids were growing up. On a camping trip with our two kids Lindsay and Andrew in 1990, I was really surprised that so many of the people I had worked with in the 70’s were still here! Kent Overby took Andrew, and sold him on being at camp. And I have been coming back since 1991. TB: What’s your favorite thing about being on staff? LC: I really enjoy working with a great group of people and spending my summers out of central Illinois. TB: There are so many great things that you prepare, I’d be hard -pressed to pick a favorite. What’s your favorite meal at camp? LC: Meat loaf is my favorite, and penne pasta with meatballs is a close second. TB: I always knew you loved to sew, knit and bake, but I was shocked to learn you played the flute! LC: And the piccolo! I played in high school and college. I always thought it would be funny to play Brahms lullaby instead of Taps at night! TB: You mentioned to me you like to read. What about TV? LC: I just finished “Catching Fire” the second book in the “Hunger Games” series, and NCIS is the only TV show I try not to miss. TB: I know it’s hard to beat being the head chef at Highlands, but if you could trade places with any person for a week, famous or not, living or dead, real or fictional, with whom would it be? LC: I would like to be Guy Fiere for a week. I love to travel, and to do that and eat great food at the same time seems incredible! LC: I’d been to 48 states, and many parts of Canada and Mexico by the time I was 16. My husband of 35 years, Dale and I added Alaska to that list. I have yet to go to Hawaii. Another thing that not everyone knows is that I have two brothers and two sisters and I’m the only one who never went to camp. TB: Well we fixed that didn’t we!? Thank you so much Lois for your commitment to Highlands. You are truly one person we couldn’t live without here at Camp! Do any of you CH fans have special memories of Lois? Maybe you’d like to throw out a big THANK YOU? We’d love to hear about them on the blog. Leave us a comment! [slideshow elements=”3″] [image link=”http://www.camphighlands.com/wp/wp-content/themes/camp-highland-for-boys/images/lois/lois01.jpg” caption=”Lois with her husband Dale”] [image link=”http://www.camphighlands.com/wp/wp-content/themes/camp-highland-for-boys/images/lois/lois02.jpg” caption=”Lois and baker, Marcella, stand with their beautifully decorated Camp Highlands birthday cakes”] [image link=”http://www.camphighlands.com/wp/wp-content/themes/camp-highland-for-boys/images/lois/lois03.jpg” caption=”Lois making french toast for 150 and the great spread for the end of term banquet”] [/slideshow] Remember, if you have questions on the end of term festivities, take a look at yesterday’s post. I know it’s been a couple of days, moms and dads, since we’ve posted photos or a blog entry, but we’re struggling with our spotty internet connection. We are working on it, and I just might need to take a trip in to town for Paul Bunyan donuts Internet to upload the picts from the last few days. So can you believe it?! Just a week left of camp. It’s zoom time now. Here’s the scoop on what the boys can expect over the next week. Tomorrow, Saturday, is Olympic Day. Boys will be placed in multi-generational groups and will be competing in a myriad of events and will even have a British-themed lunch of fish and chips (ok, they’re sweet potato fries, but it’s close!). I see that on the menu, Sharon wrote “Olympic ho-ho cake.” Trust me, that cake would medal in any competition. I once asked Lois what went into that cake and she told me, “You don’t even want to know.” It’s so good! Sunday will be our final Assembly and Sing. Tuesday will be our last Division day, Wednesday is the “Stunt Show” (our talentless show), Thursday is Kerchiefs and Friday is the final Banquet. See what I mean? It’ll go by quickly. So parents, start socking your pantries now, these boys will be back in their own beds, eating you out of house and home again before you know it.